Cambridge Mini Maker Faire | Real Live Makers Showing They're Amazing! I demoed ACRIS at the Cambridge Science Festival’s Mini Maker Faire. Charles and Shane were also there demoing their spectacular skills. Bald Wisdom » Blog Archive » Debut of the DuckyBots! DuckyBots was total crowdbait. 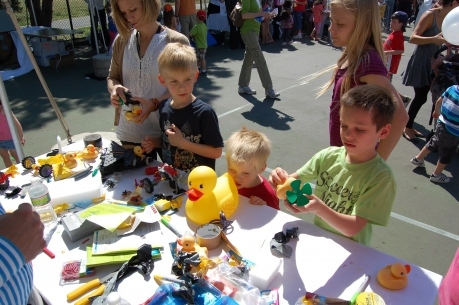 Kids and adults were thronged around the booth modding and testing robotic ducks until we had to take the pond away, pack up the motors and put the yellow duckies into their little nests for the night. 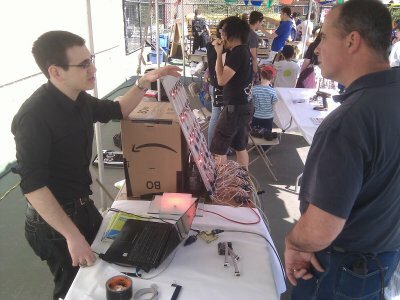 Check out Kevin’s comprehensive update on participating in Cambridge Mini Maker Faire for more details. 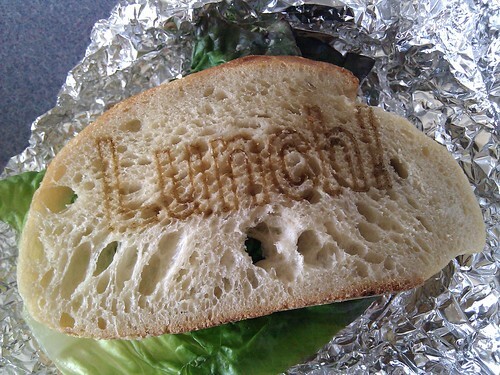 After watching The Last Leaf in video form, I had a hankering for lasered lunch. While I was interested in the video from Ok Go already, I’ve seen it a few more times in the past week since danger!awesome exhibited at Cambridge Mini Maker Faire. We realized from doing that video that we can do anything. Even if we don’t know how. We can assemble a team of people and do it. If you don’t know how, that shouldn’t stop you from getting started. As lunchtime approached, It occurred to me that there was some nice bread on my sandwich. Nice, laserable bread. I made some letters, arranged the sandwich on the bed, adjusted the placement, and gave it a try. While I was lasering up my lunch, some students stopped by to work on projects in my classroom. They got a kick out of it. I took a few photos because, well, I was going to eat the evidence. As the next class of students came in, I showed the pictures. Word does travel fast, since a few students into the group, one of them told me he had already heard about my Sammich Experiment. This brings out the importance of meeting other makers. We need to see each other’s work, hear the stories of creation, and inspire each other. Seeing what somebody else did can cause each of us to reach to new ideas in our own creative work, which can influence the important creative work of others. I showed my lasered lunch project to a few people, and it got some of them thinking about their own projects. Pass it on! We had a great time at the 2012 Cambridge Mini Maker Faire. It was nice meeting up with Boston area makers, seeing their work, and hearing people explain their ideas, and the things they’ve made. The weather was sunny and nice, not too hot, though a bit windy (and we skipped the TWO thunderstorms of the 2011 Cambridge Mini Maker Faire). Ellen Bluestein from Cambridge Science Festival puts in an enormous amount of work each year wrangling all the logistics, people, volunteers, vendors and more. Gui and Molly of Artisan’s Asylum and Joe helped out with insurance and creating a funding system. In it’s third year, this is the first time we have needed to pay for anything significant. This time, we had to pay a couple hundred dollars of insurance coverage, here’s the link, if you would like to contribute to our modest expenses. Shawn Wallace came up from Providence Rhode Island to staff the MAKE table, answering questions about the magazine, publications and Maker Faire. Abe Shultz did a bunch of early setup work. Dug North helped out with publicity, and bringing in new audience members. There were a lot of amazing maker presenters this year, new projects, improved developments and enthusiasm were evident: Abe Shultz, Dug North, Artisan’s Asylum, danger!awesome, DIY BIO, ACRIS, Charles Guan, Tufts University Robotics Club, Boston Area Makerbotters, Parts and Crafts, Kiwi’s Tiny Books, Electric Motorcycle, ComBot, DuckyBots, Shane Colton, and many amazing members of the MITERS community. It was really great seeing everybody, renewing connections, and making new contacts. If you missed out on the fun, or would like to connect with other area makers, you can like the Facebook page, join the Boston Area Maker Faire group, check out the photos in the Flickr group. Artisan’s Asylum has built an amazing space helping people learn through making while developing connections and relationships around the work. 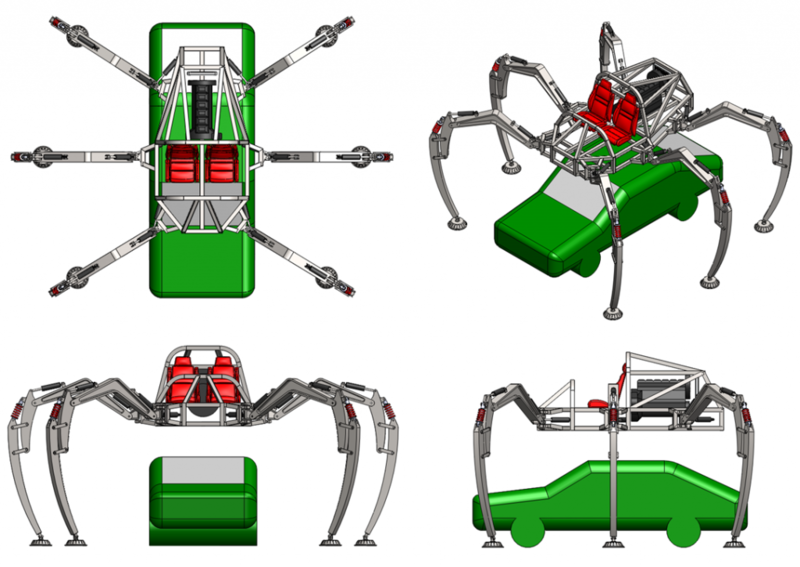 The community of makers is growing, with new organizations and opportunities all the time. You should also check out Maker Faire, which has major festivals in the Bay Area, Detroit, New York, and lots of Mini Maker Faires worldwide. 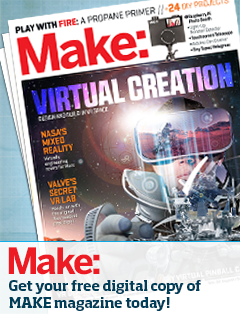 You can even make your own Mini Maker Faire. Come on down to the Cambridge Mini Maker Faire today! You can meet up with other makers, get some project inspiration and talk to a MAKE magazine author or two. While you are there, stop by the MAKE booth to enter to win one of two pairs of weekend passes to World Maker Faire 2012. Admission to the Cambridge Mini Maker Faire is free. Come join us to meet great people and see amazing projects from noon to 4pm on Friday, April 20th at the Cambridge Rindge and Latin High School. The CMMF is sponsored by Artisan’s Asylum, and is part of the Cambridge Science Festival Carnival. ACRIS is a really neat LED controlling system developed by Joseph Colosimo, a student member of MITERS, the MIT making paradise. He will be displaying the device and components at Friday’s Cambridge Mini Maker Faire from 12-4pm. ACRIS is a high-power lighting system that reacts to its environment using high-power LED controllers and software that takes sensory input, like music, and generates beautiful output patterns. It’s also a generic framework that others can use for their own projects. There’s more info over on Joseph’s site for ACRIS. Katie Gradowski and Will Macfarlane operate Parts and Crafts, an awesome program for maker kids in Somerville, MA. They’re running a vacation camp this week. They’ve built into their planning having their campers organize and conduct a hands-on exhibit for kids at the Cambridge Mini Maker Faire this Friday from 12-4pm. We do a bunch of different kinds of projects, and we’ll be coming to the Cambridge Mini Maker Faire with some interesting things that we’ve made, at the moment, along with smaller things, this is looking like it should be a bike-cart built into some kind of space-ship shape, some backpack mounted pressurized water-guns, along with materials on how to make a couple of small interesting projects. DIYbio is a group that meets in the Boston area to explore the biology you might have missed in school. Come see what happens when you hack protein so that it becomes green and florescent at this Friday’s Cambridge Mini Maker Faire from 12-4pm. Want to know even more? They’ve got a mailing list, and are having a public meeting on Sunday, April 22 from 4-6pm at Sprout, just outside Davis Square in Somerville. 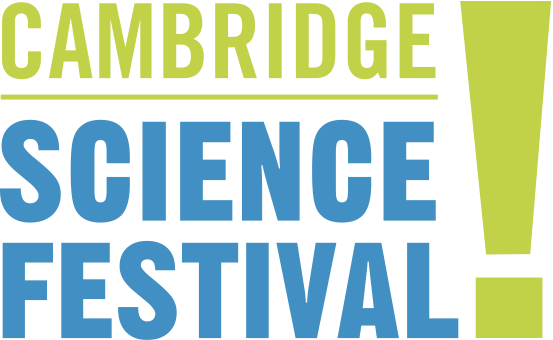 Admission to the Cambridge Mini Maker Faire is free. Come join us to meet great people and see amazing projects from noon to 4pm on Friday, April 20th at the Cambridge Rindge and Latin High School. The CMMF is sponsored by Artisan’s Asylum, and is part of the Cambridge Science Festival Carnival. Looking for directions? We’ll be at 449 Broadway in Cambridge, MA. After producing the music video for OkGo’s song The Last Leaf, Nadeem and Ali had 3,000 pieces of toast and three laser cutters. Knowing that not everybody has access to rapid fabrication tools, they created danger!awesome, a laser cutting and fabrication workshop in Central Square, Cambridge. If you have an idea, and it doesn’t yet exist in this world, they might be able to help you make it real. danger!awesome is a project of mine and Nadeem’s; our goal is to bring high-end fabrication equipment to the public for art, customization, and personal fabrication. Our laser cutters are left over from a project that we did with OkGo. We’re teaming up with artists and the generally clever to make interesting things. On Friday we’re planning on bringing business cards, samples of materials that we can work with, and a few geeky items. Come meet them, see examples of projects made in their shop and find out how you could design some awesome of your own at this Friday’s Cambridge Mini Maker Faire from Noon to 4 pm. For a bit more information on danger!awesome, you might check out this article in DigBoston, or this one behind the paywall at the Boston Herald.